Sometimes you can't fit all of the stories that you'd like to include within the constraints of a one hour radio show. So now we're introducing Spark Extra, a feature where we spotlight interesting stories and bits that for one reason or another, we couldn't include in the full episode. 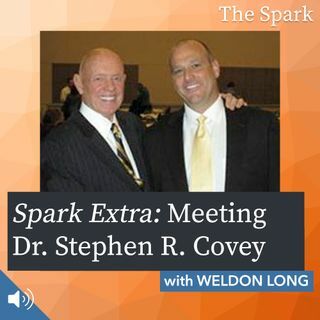 In this excerpt from our conversation with Weldon Long (The Spark episode 013), Weldon tells a wonderful story about his journey to meet Dr. Stephen R. Covey, internationally bestselling ... See More author of The Seven Healthy Habits of Highly Effective People. A reminder that The Spark With Stephanie James has a new broadcast home: NoCo FM. New episodes of The Spark will continue to air Wednesdays at 9pm Eastern/7pm Mountain, exclusively on NoCo FM. We hope to see you all there!